Fancy yourself an environmentalist? Eat meat? Well, according to "Cowspiracy" it's time to either put your money where your mouth is and step away from that burger, or find another way to self-identify. The revelations made in this film are brutally inconvenient, for all types of eaters. Whether you're a vegan, vegetarian, Meatless Monday supporter, pescetarian, or an organic-loving meat eater, after watching this film you'll be left thinking, a lot, about your everyday food choices and how those choices impact the sustainability of our planet. This film has a simple thesis (based on reports by two international and independent institutions): What is being done about the impact of animal agriculture on our environment? The answers, or lack thereof, will astonish and bewilder you. If that isn't enough, the information presented about consequences of agribusiness and its direct relationship to the degradation of the environment on a global scale will make you think twice before reaching for that pork chop. Looking past the Michael Moore-isms, sometimes-hyperbolic interviewees and the familiar outline of other progressive documentaries with an axe to grind, the facts are laid bare. The bottom line is that the ramifications of animal agriculture, as presented in this film, are not being adequately addressed by major environmental groups, the media, or the government, and finally someone has put together a cohesive collection of information for public viewing and opinion. One of the films many gasp-worthy moments comes from a stated statistic: 75% of American's consider themselves environmentalists. Well, as the facts in this film prove, you can't be an environmentalist and eat animals, or fish. Less than 3% of Americans are vegan. This documentary isn't about discounting the efficacy of environmental groups, government-funded environmental initiatives, nor is it vegan propaganda; it's about bringing further awareness to how our everyday choices impact the environment. Some things to remember (despite what might be indirectly suggested at times during the film): 1) All environmental issues are important, 2) Every little bit that one does for the environment counts, and 3) the impact of agribusiness on the environment deserves more consideration. The film ends far from where it begins, and on the 85-minute journey you'll experience many harsh realities, but several soft ones too. If you're an environmentally conscious person, you'll go into this film thinking, "I'm good. I'm doing my part. "-If only it were that simple. 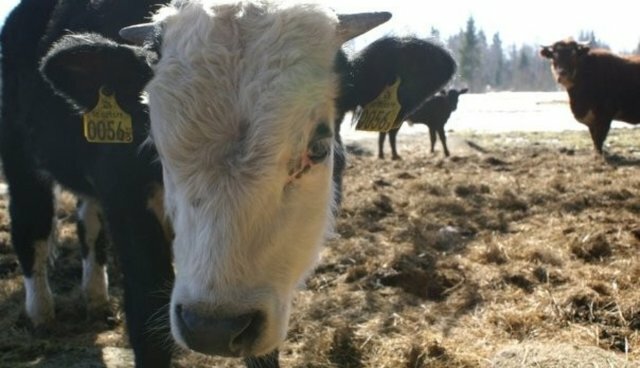 If you're a vegetarian, get ready for a shock in terms of your negative environmental impact; pescetarians (ugh)-enough said; and eaters of grass-fed beef, free-range chickens and/or pigs, you will not be able to justify the negative impact your food choices have on the environment and the rest of us. Even being a vegan doesn't exempt you from contributing to meat consumption. How? Well, you'll just have to see the film and find out.